SQL Server is used by many medium and large sized companies and enterprises for database management. Most of these organizations have a booming business, which means increasing number of employees and ever-growing size of database. For all the companies who use SQL Server for their database, High Availability (HA) and Disaster Recovery (DR) are two important aspects. Having an effective HA & DR policy helps companies to avoid business downtime and achieve maximum productivity. Here we will depict some solution to have High Availability and Disaster Recovery in SQL Server. But before that, let us learn about High Availability and Disaster Recovery. SQL Server High Availability means 24×7 availability of database for seamless usage even during planned or sudden outages. It is important to ensure High Availability in case of some catastrophic events. A disaster can affect your database in no time and cause you immense inconvenience. With a Disaster recovery plan, you can easily avoid loss of mission-critical data from your SQL database. Since HA of a database cannot ensure the correctness of the data, users should also have a good DR plan in place. A good disaster plan should be able to tackle all type of man-made or natural disasters. It is always advised to have High Availability and Disaster Recovery plans together. In this section, we will discuss some methods that should be included in the HA & DR plan for your organization. Clustering is a nice way to ensure High Availability. It covers us during Server failure but does not work in case of SAN failure. When Storage area network (SAN) does not work, cluster also goes down. For this reason, clustering cannot be used during Disaster Recovery. Replication is a good solution for Disaster Recovery. But in this process, we do not copy the entire database. Rather, we copy some certain components like tables, views and other objects. It means that the secondary SQL database is not a carbon copy of the primary database. Since the replicated database provides delayed response, it is not considered as a solution for High Availability. Just like the earlier two methods, log shipping also involves both primary and secondary databases. With this method enables, log backups of primary database will take place in the secondary database in a scheduled interval(e. g. after every 5 minutes.) However, the problem arises if the Server closes down within this 5 minutes. Then you lose your data. Despite this disadvantage, it can be used as a measure for Disaster Recovery. Database Mirroring can be a part of HA & DR policy. We can have only one copy of the primary database. If we have more than that, we are unable to read from secondary server. The database in secondary server will be in recovery mode. Database backup is a popular and effective process often done for Disaster Recovery. Regular full backup can be restored in the database become irreparably infected or data get deleted accidentally. It is possible that you have not got any policy SQL Server High Availability and Disaster Recovery policy. If any disaster happens in such situations resulting into loss of data, SQL Recovery software can be a helpful solution. This application can get you back your lost data from SQL database, whether they are accidentally or intentionally deleted. Its compatibility with all the major SQL Server versions including 2017, 2016, 2014, 2012, 2008 R2, makes it an all-rounder tool. Having a well-researched SQL Server High Availability and Disaster Recovery policy and its implementation is a prerequisite to proper SQL management. Every organisation with SQL Server should have a proper HA & DR policy in place based on the requirement. If there is no such policy and some database tables got deleted. 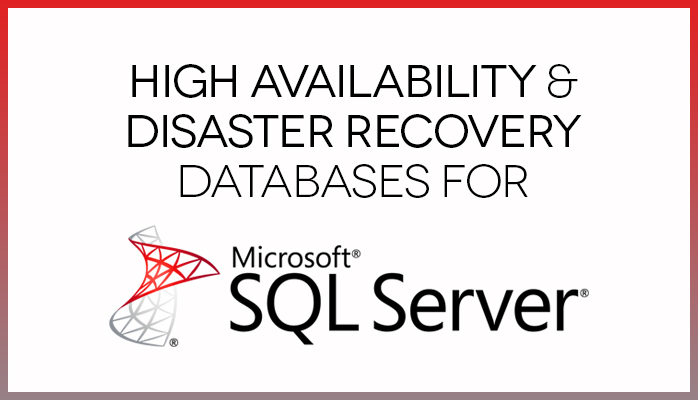 You can recover those tables’ data using SQL Recovery.